In the Roman times, a small fort was built along the Mur River in what is now southern Austria. Later, Slovenians built a larger fort in the same place. 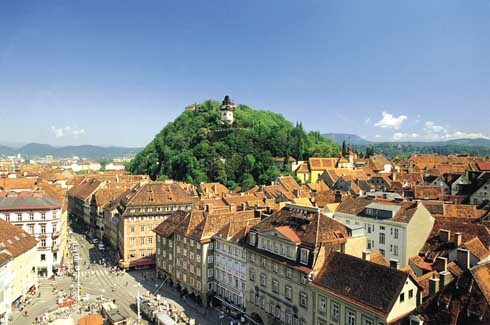 Today, that spot makes up the city centre of Graz, Austria’s second largest city. 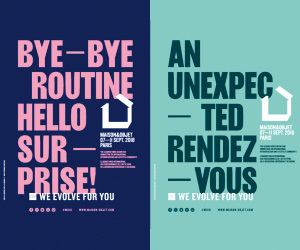 In the last decade the city has been fast gaining reputation as a cultural and design hub of the region. Graz is sunny year round but seldom too hot, even during summer. Much of the rain occurs in late spring and early summer so the best time to visit is from end of July to early October. Winters are chilly and Graz’s milder, less windy climate leads to smog during the winter months. The Old Town of Graz displays the influence that the surrounding areas had on the city. Buildings from different eras and in varied architectural styles stand in harmony. The city’s existing townscape was an important factor for it being added to the network of UNESCO City of Design in 2011. But, this title fuelled a certain confidence in Graz to continue to implement design in its everyday life. In 1870 Carl Wiesler bought five guesthouses and converted them into the present-time Hotel Wiesler. Over the years the hotel has seen some ups and downs, but through it all, it has remained an inspiration of design and has served many generations of visitors. 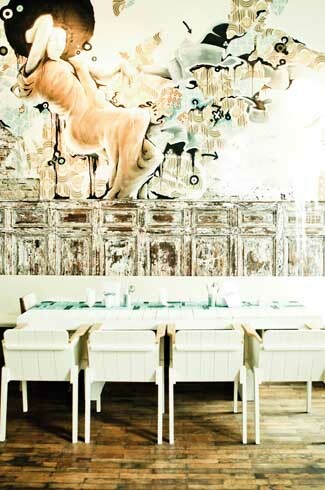 The latest makeover by owner Florian Weltzer challenges all the norms that tradition demands of a 5-star hotel. In his own words, he has taken Wiesler from ‘5 stars to independence’. The design is unconventional and contemporary, yet the ambience is fresh and welcoming. A large portion of the original detailing has been retained, restored and well integrated with the new modern look. The traditional dining hall makes way for Speisesaal, the new hip restaurant which is popular with both the hotel guests and locals. Mismatched retro furniture, the grand yet contemporary murals adorning the walls and an ornate chandelier come together to achieve a setting that is glamourous without being superfluous. It is apparent from the hotel’s character that it is intent on breaking through the stuffy 5 star barrier and presenting a fun and chic personality. About a decade ago sewage water and industrial waste had taken over the River Mur. It needed to be reclaimed by the people of Graz. 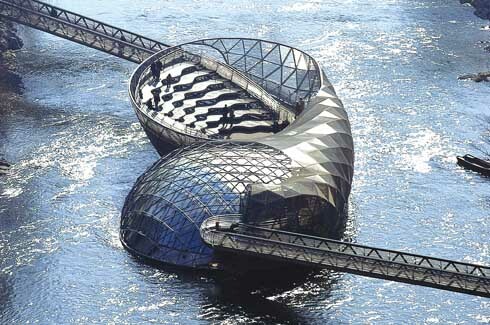 It was with this purpose that the Murinsel or the Mur Island was commissioned to American artist Vito Acconci. Crafted out of metal and steel, the 47m long structure stands in the middle of the river connected to both banks by two footbridges. Shaped to look like a half-open shell, the Murinsel houses a café in its closed section and an open amphitheatre to make the most of the sunny Graz weather. laden 21 promises answers to all furniture needs, be it for homes or public spaces, for the entire house or for one room. And what they don’t have they promise to seek. 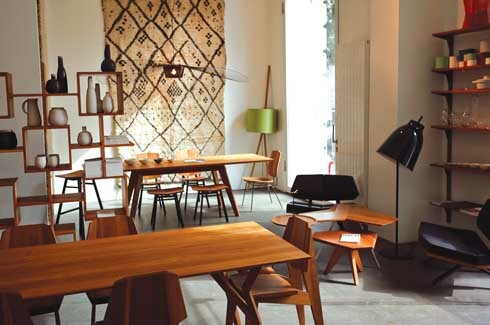 The store specialises in furniture from the 20th and 21st century, high quality carpets, classics like chairs of Corbusier and one-of-a-kind home accents and accessories. The Laden 21 team includes expert architects and interior designers who have the experience and the international network to scour for unique furniture pieces to add to the store inventory on an ongoing basis. The creators, Peter Cook and Colin Fournier nicknamed it the Friendly Alien. And the name fits. 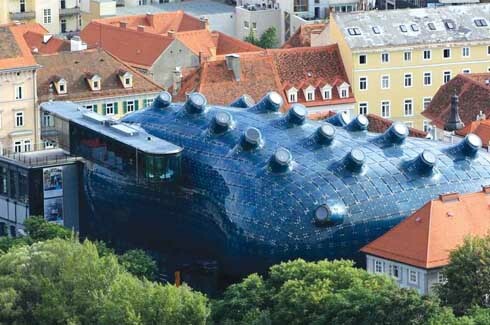 The blob-like grey Kunsthaus Graz looks like it dropped from outer space amidst the red roofs and the baroque structures. Instead of following the standard principles for an exhibition hall structure, the designers worked along the lines of blobitecture and gave it an amoeba-like bulging shape. Kunsthaus provides a venue for the display of multidisciplinary art from the 1960s to the present day. There is no permanent exhibitionand its galleries are enabled to meetthe requirements of a variety of contemporary exhibits.